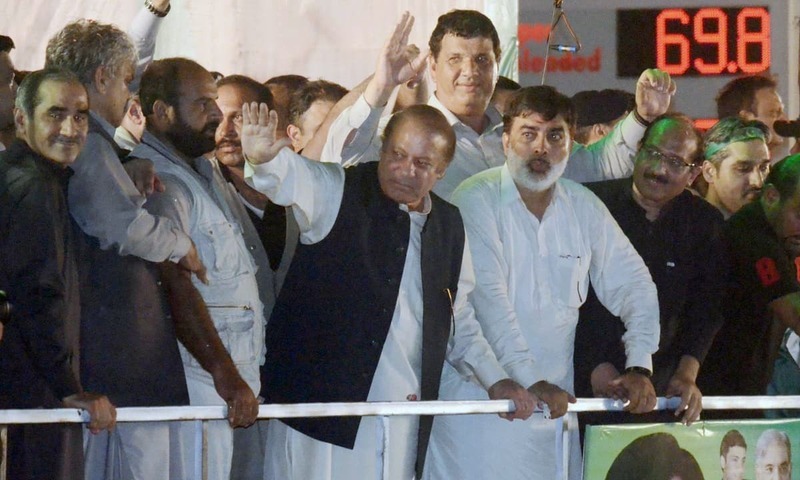 Former prime minister Nawaz Sharif's caravan arrived in Lahore from Gujranwala late on Saturday, the fourth and last day of his 'homecoming' rally, which had set off from Islamabad on August 9. "Have you accepted Nawaz Sharif's disqualification?" he asked supporters while making a brief stop at Shahdara. "Everybody said they did not accept the [Supreme Court's] decision," he told the gathered crowd. 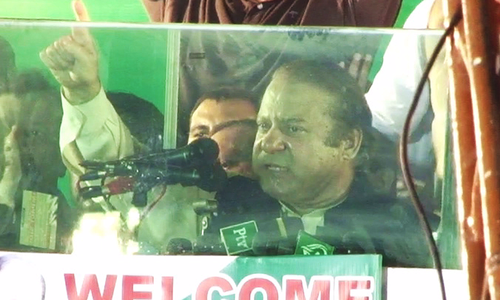 Nawaz Sharif speaks to his supporters at Shahdara in Lahore. "Nobody has accepted this verdict. I will not sit in peace and accept it, and neither will you. Do you promise me?" he asked, receiving a resounding "yes!" in response. "Let's head to Data Darbar," he had said, putting off the rest of his much-awaited final speech for later. It had been reported earlier that Sharif may not stop at Shahdara, but head to Data Darbar directly; however, he chose to briefly stop and address workers and urge them to head towards the venue of the final speech. 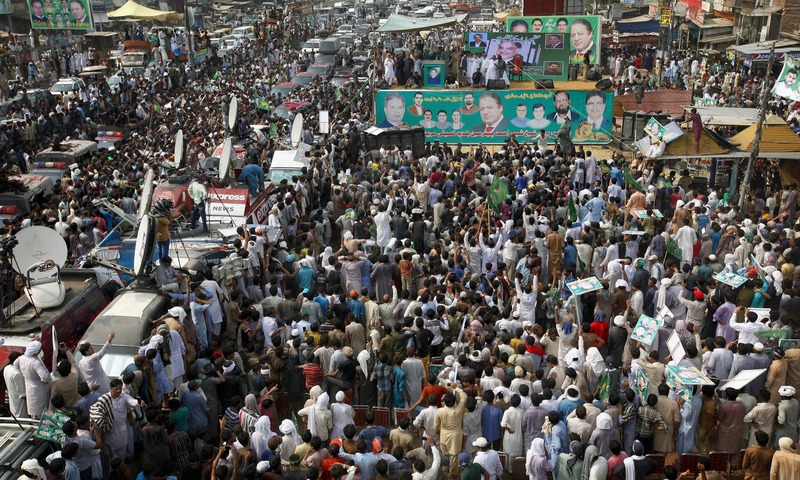 Meanwhile, a large gathering of PML-N loyalists had amassed at Data Darbar, choking the area. Roads around Lahore remained blocked for the event, with traffic running only one-way. Shops had been directed to remain closed. Nearly 8,000 police officers were deployed to ensure security at the venue of the speech, while 2,000 traffic wardens had been deputed to control traffic. "What am I seeing today in Lahore?" 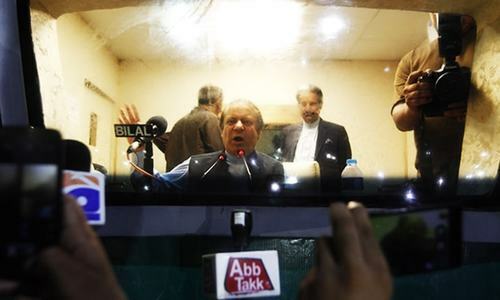 Nawaz Sharif said as he started his address to the mammoth crowd at Data Darbar. "I have never seen anything like this before." 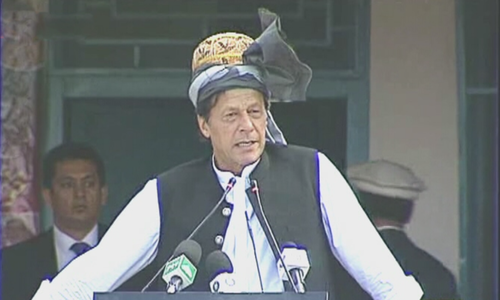 "You made me a prime minister, and five people — five people — disqualified me," the deposed prime minister said, stepping into his stump speech for the rally. "Tell me, is their verdict acceptable to you?" he asked, to loud shouts of dissent. "I have come to you after four days on the road. 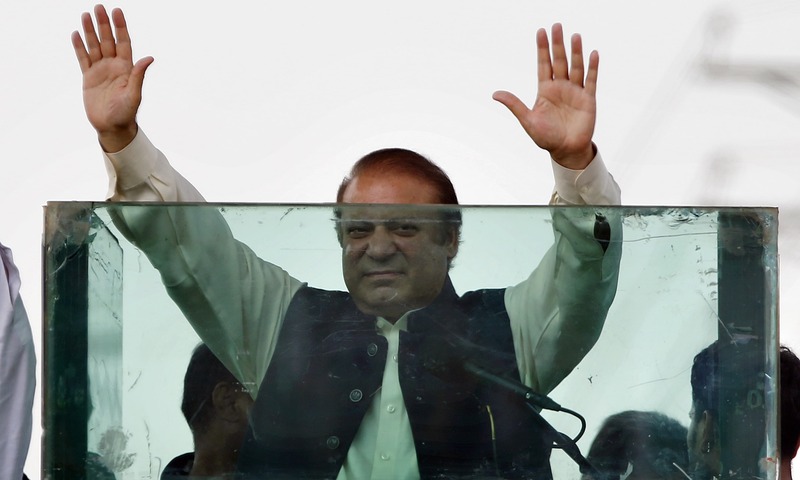 Everyone in Pakistan is protesting Nawaz Sharif's disqualification," he told his supporters. Turning his guns on the Supreme Court judges who deemed him unfit to hold public office, he said: "Those who disqualified Nawaz Sharif, are they themselves qualified [to make that decision]?" "Nawaz Sharif was not involved in any corruption or any misappropriation. They disqualified me for not taking a salary from my son — what is that to you [the judges]? Whether I take something from my son or not, what is that to you?" "They have been treating your prime ministers the same way for the past 70 years," he said, addressing the boisterous crowd. "Is this acceptable to you?" Recalling that he was elected on promises that he would end electricity load-shedding and initiate development projects, Nawaz Sharif asked his supporters if he had not delivered. "When so many good things are happening in the country, is this how your prime minister should be treated?" "No! This is unacceptable to us!" he said. "Three dictators have devoured 30 years of this nation's history. This cannot do! Pakistan has to change!" he roared, ramping up the gears. "The passion and spirit I'm seeing is a harbinger of a revolution!" he said. "If this revolution does not arrive, nothing will change. If this revolution does not happen, we will become the worst nation in the region." "No other country has experienced upheavals in its democratic process like we have," he claimed. "Who are these people who have disrupted our progress? Do you not think that they should be held responsible? "The people who've played with Pakistan for the last 70 years — don't you all think that they should be held accountable?" he asked his supporters, who responded with a resounding "yes!" "You will have to take a brave stand against these people!" he urged. "This country has already been a victim of a grave accident in 1971 — I hope that something similar never happens again," he said, recalling the secession of Bangladesh from Pakistan after a political falling-out over which wing of the country would install a prime minister. Turning again to his 'achievements' as a leader, he asked: "Is the Pakistan of 2017 not better than the Pakistan of 2013? ", which was responded with loud shouts of "yes!" "Shouldn't Nawaz Sharif have been praised for what he achieved?" he asked. "Shouldn't the 200 million of this country hold dominion over its affairs?" he continued, again to resounding cheers of "yes!" "Shouldn't the vote of the 200 million people of this country be held sacrosanct?" he asked. "Nawaz Sharif will make this happen for you. 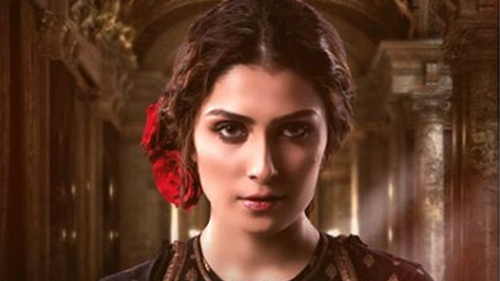 If you order it, I will offer my life and my power to this cause," he roared. "Nawaz Sharif has never deceived you," he continued. Despite everything — the dharnas and the conspiracies against our government — we have delivered on our promises, he claimed. "Think of where we would be if we hadn't been held back [by our opponents]," he said. "I wish for us to have a better future. To do that, we have to change the system. This system is plagued by a virus, and we have to cure it," he said. "[Right now] we are not fit to stand up to the world. When Pakistan changes, your destiny will change too," he said. "There's no social, judicial, political or economic justice. We will bring a system that will give justice to whoever has been wronged. We will dispense justice in 90 days," he thundered. "We will need to make new rules. We will need to change the Constitution. But we will change the system," he promised. "Do you want this naya Pakistan or not? Where your vote is respected? Where your honour is preserved?" he asked, to resounding assent. "The sacrifices we gave to create Pakistan have still not borne fruit. For 70 years, we have been meandering around. Look at our neighbours: do any of them suffer from the problems we do?" he asked. "You will have to support me," he said. "I am no longer a prime minister, but you have to support me." "I have come out for justice, not for power," he continued. "I have come not for my rule, but for your rule over this country." "Swear your loyalty to me, but swear truly," he urged. "Tell me, what you swear to, will you fulfill?" he asked, receiving loud cheers in response. "Will you stand with me as we bring a revolution to Pakistan? It is August 14 day after tomorrow: remember the sacrifices of the people who made Pakistan. We have to honour their sacrifices. They must be rolling in their graves at what we have done with this country," he said. "I will never forget the love I have received on this trip. I promise to bring forth my [new] programme [manifesto] on August 14, and I have full faith you will back me when I do," he said. "Tell me, will you remember your promise to me?" he roared, inviting loud shouts of "we will!" Sharif's motorcade was supposed to leave Gujranwala on Saturday at 11am, but was delayed till 12:30pm due to unknown reasons. He had stayed overnight in the city after delivering a fiery speech on Thursday in which he raged against the judges of the Supreme Court. 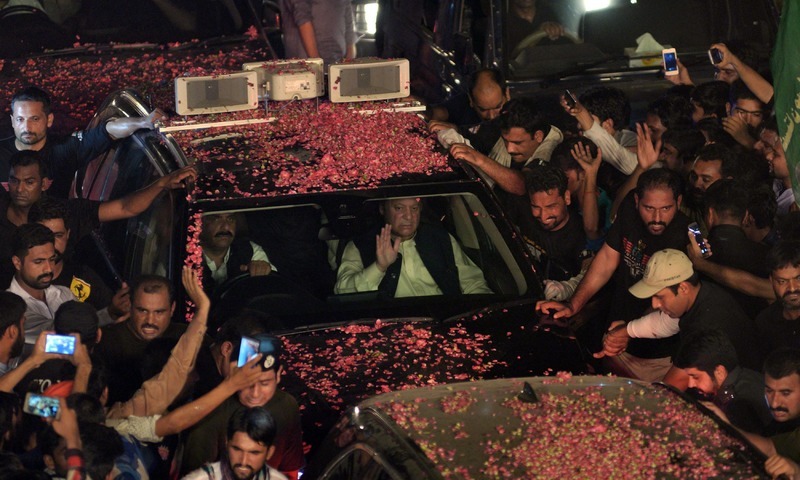 Sharif's motorcade had stopped at Muridke, its last stop before Lahore, where a large crowd of supporters had gathered to welcome him. The caravan was joined there by a rally from Sialkot, led by Minister of Foreign Affairs Khawaja Asif. PML-N leader Abid Sher Ali also arrived to welcome the ousted PML-N supremo. Sharif spoke to his supporters in Muridke, repeating elements of the speech he made at previous stops but also making the startling demand that his loyalists prepare for a 'revolution'. "Do not be disappointed," he started, "do not worry. This is your victory. This is the defeat of those who have held the nation hostage for 70 years." "The 200 million people of this country are the real owners of this country. A few cannot over rule them. We will make the 200 million people of Pakistan its real owners again," he said. "Nawaz Sharif has come to you. Did you not send Nawaz to Islamabad after making him prime minister?" he asked, prompting assent from the crowd. "But he was thrown out by someone else. Is this decision acceptable to you?" he roared, with the crowd responding with a resounding "no!" "Pakistan belongs to its 200 million people. The decision [to depose me] is not yours. If Nawaz Sharif would have been involved in corruption, you would have dragged me out of office yourself." "There are no allegations of corruption against me. Tell me, people of Muridke, do you accept this [the Supreme Court's] decision? Is this insult acceptable to you?" he said, receiving loud responses of "no!" 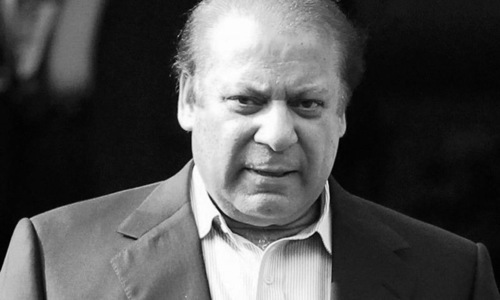 The deposed prime minister then repeated elements of the same narrative he'd built in Jhelum, Gujrat and Gujranwala: urging his loyalists to seek accountability from those who'd ousted him from power; reminding them of his government's achievements; and taking credit for tackling the country's problems, most prominently to have lowered load-shedding (and promising it would have disappeared by next year had he been in power). "I was serving the country and its people. I was building roads and motorways. Balochistan was progressing; young people were starting to get employment. If I had been allowed to complete my tenure, there would have been no unemployment in this country," he claimed. "For 70 years, Pakistan has been played with. No other country in this world is being cheated like this," he said. He also continued to rile up his followers, telling them that the Supreme Court decision was an insult to their vote and that the apex court had lowered Pakistan's standing in the international community by sending him packing. "Shouldn't there be a revolution?" he said. "Are you ready for a revolution?" he asked. "Pakistan is being embarrassed in the world because of this decision. People across the world and Pakistanis are rejecting the decision." "The world is laughing at Pakistan," he said. "I cannot accept this." "Will you stand by Nawaz Sharif in the revolution?" he asked, inviting cheers of "yes!" "I know Muridke will stand by what is right. They will not bow down." "Stand by me when my message reaches you," he urged. "Do not let your passion die. Do you promise to stand with me?" he asked, prompting cheers of "we will!" Talking to DawnNews, Rehman rejected PML-N's narrative that Nawaz Sharif's ouster poses a threat to democracy and therefore, PPP has not joined the ruling party's rally. "We (PPP) have been called friendly opposition in the past because we stood with the government to protect democracy at the time of the [PTI's] sit-ins. But democracy is not related to Nawaz Sharif's personality and it is not under any threat," she said. Speaking on Nawaz's rally, Shirazi said that the former premier should have emphasised on reaching a national consensus instead of taking to the roads. "The narrative Nawaz Sharif is trying to develop [by this power show] is not the best way to tackle this issue. 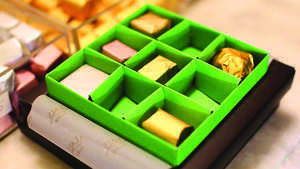 He is trying to take things towards institutional collision," he said. adding that Parliament was the best forum to address this issue, which he [Sharif] did not respect. 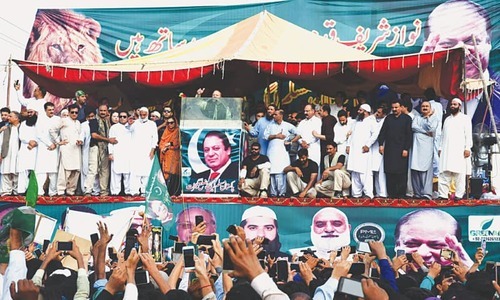 The DawnNews anchor views the rally as a "three-pronged model with Shahid Khaqan Abbasi in the centre, Shahbaz Sharif in Punjab and Nawaz Sharif reaching out to the public", that benefits PML-N.
Abbasi said that the rally is Sharif's "campaign for relevancy". "All leaders that have been [deposed] have stayed politically active. If Nawaz Sharif leaves quietly, his party and voters will be disappointed," she said, deeming it important for Nawaz to keep himself involved in politics. "Shahbaz Sharif will continue in Punjab to complete the projects he has started, while Shahid Khaqan Abbasi is in the centre and is a dignified personality that is acceptable to all quarters. Nawaz Sharif had no other option but to come out on roads because sitting in Raiwand would have meant political redundancy," Abbasi added. However, she disagreed with Sharif's rhetoric and the narrative he is trying to develop through his speeches. "I am shocked by the talk of revolution, because even if you want peaceful a revolution, it is against a sitting government," she noted. "But the government is your own. What do you want?" she asked. "This is a [show of] no confidence for the cabinet you have yourself chosen." "Inquilaab [revolution] is an over-used term in Pakistan," the veteran analyst said in reaction to the Muridke speech. "This word is used again and again and I don't think it holds much value. 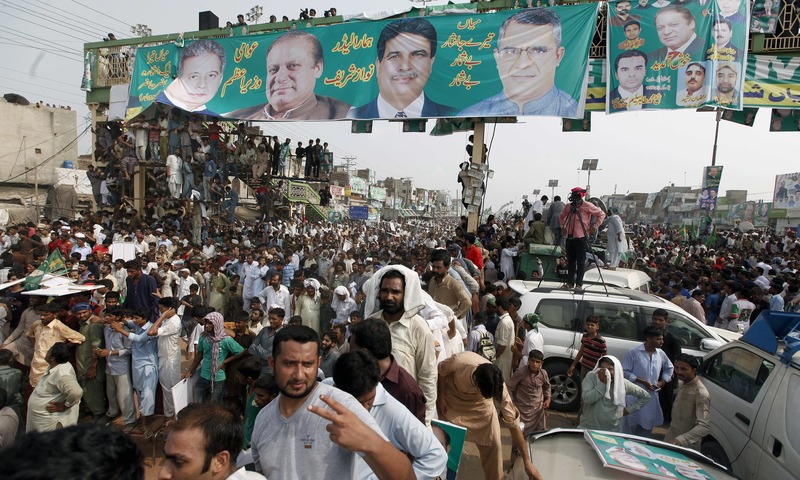 The point of this rally was that the voter and his right has been violated, which he [Nawaz Sharif] has been able to convey well Jhelum onwards," he said. "The process of 'getting' Nawaz will get quicker and he may have to see jail," Javed feared, "and a petition could be moved to not air his speeches live since he is committing contempt [of court]." Editorial: Why not call a snap election in Pakistan? And that's where he's going to stay! Thank God that boring drama has come to an end! Another few hundred paid individuals will again participate in this absolute flop show of strength by PML-N. The objective of the this rally still remains a mystery. The more PML-N is exposing itself the more damage it is doing to its already lost image. Sad to see that there are so many people who still believe in him!!! When will flop show of so called strength end. PML-N is becoming a joke. @Sab se pehle pakistan - Wrong! They don' t necessarily believe in him, just because they are induced to come to watch the Circus passing by! Even you and I can could make some false promises and create emotional slogans, and the same people would vote for us. @Mahmood: How can we leave this stage of perennial dramas to hoodwink unsuspecting masses, this way or that? This is what we vote to get at a big cost and spending limitless energies. @Sab se pehle pakistan Zindabad friend. 70 years in the wrong direction!!! @mrs.majid sheikh Please find out from the Karachites who are under more distress under street crimes and other criminal activities. @KKM Don't get fooled by the big crowds. They are masters of gathering people. It's all free food and money. Typical slogans he has been making for years to fool the people while transferring money from Pakistan overseas illegally and the hiding it behind fictitious company name. But this time it is different. He was ousted on clear evidence of corrupt financial practices. Much PTI trollery going on here. But in their hearts they know their dharna leader can't beat Nawaz Sharif in an election. The ultimate implosion would be if he still can't do it. They seem to be unable to fathom that in a democratic plurality people may have other priorities than the narrow and myopic vision of their leader. Personally the silent majority will welcome army rule than than sham democracy where rich and corrupt enjoys, poor suffer and system crippled by the ruling type. For the sake of peace, I humbly request our chief justice and supreme court to take immediate action and banned Nawaz Sharif making provoking speeches and inciting people against our brave army and judiciary. This is against our constitution, and if disqualified Nawaz Sharif is not stopped now, he will probably declare open war and attack on supreme court and our judges. This is a wake up call for security and law makers! excellent -- its time for revolution..
At long last this circus show is coming to an end. His remark against all is not going to do any good to PML-N. Most surprising was that he did not mention about NAB investigations and kept on repeating his cleanliness and being non-corrupt. The crowd around him is with him whatever he says so they don't have to listen, the others are not reacting to what he says. Looks like there is no one listening to him. Revolution? Are you people dumb or something? It's not until the people of this nation become good that we can moe forward. I ask the ex PM. Are 3 times not enough!!! he wants anarchy and chaos. An ousted PM is trying desperately to remain relevant, however the game is over! Yes, Pakistanis are ready for the "go Nawaz go" revolution lols!! Interestingly Chaudry Nisar Ali is missing from these rallies. @Azad Khial : One can not add any more. Well said. @KKM I see three of you alright! @mrs.majid sheikh ... You are free to make your own choices and have opinions and so do others who would like to disagree with you. Long live Nawaz Sharif. Nawaz Sharif Pak PM for the 4th term. @Imtiaz Ali Khan: Thank you. I appreciate your kind comment. The economy has obviously improved, load shedding has drastically been cut down and there have not been any scandal in this era. All cheers for the man-- nawaz sharif. This is the repeat version of Nawaz Sharif complicating things for Pãkîstãñì judicial sysytem Supreme Court(SC) should take Suo motto action against Mr. Nawaz Sharif as he is taking law and order in his hands by inciting nations population to rise against the States Highest Legal Courts (SC's) Ruling for (his disqualification as PM). Enough is enough! I will not surprised if he is re elected again as PM by public as Lahore is still his strong hold and he did some thing for people as compare to PPP who won in Sindh twice despite zero performance and people are totally frustrated from PPP. Liaqat Ali Khan was a nawaab and a rich person before Independence. When he moved to Pakistan, he let go every thing and when he died he was wearing torn undergarments and pants which had holes in them. The family didnt even have enough money to bury him so had to take a loan. He refused to enrich himself always saying "agar meri awaam gurbat me he to Pakistani wazeer e aazam kese aaraam se rahe". Such was the character of our founding fathers. Shame on Nawaaz and his followers who plundered and looted nations wealth. Shame on our system to allow these bandits to roam freely and have an audacity of chanting slogans. When will these parasites go away, is a question which "aam aadmi" asks daily while working hard to earn a loaf of bread for kids at home. It was, by all means, a very successful power show. I wish someone could install the civilian supremacy. I hate NS for many genuine reasons but he had the right to complete his term and the mandate of the people should have been respected. I think it is the time to draw some lines and make the General concentrate on their real Job, i.e defending the borders. Justice in 90 days? When were the Model Town murders committed openly. Is there any justice in sight? Your money trail is still a mystery. What is given to the public is peanuts compared to the money stolen by politicians from the public money. Mr Sharif ! You have lost the plot. Revolution against your own government?? You are inciting the crowd towards violence and for this you pay dearly. Stop this act of madness. The law should not be broken. This is contempt of SC. Action should be taken, He should rest in a famous place. He is great leader of our time. Justice in 90 days! Now that is what I call a promise. Let us see if the person responsible for the death of the poor boy in Lalamusa yesterday in a 'hit and run' incident is brought to justice within this time. All the evidence is out there yet FIR was registered against unknown culprit and we all know what that means. He said he will bring in a new program. So what is wrong with the old program? Looks like he is realizing that old program got him unseated so now is the time to announce a new program. But it's too late, buddy. It is time to go to jail and return that laundered money. 200 million did not vote for nawaz sharif. Look at the total number of votes he got. PMLN is still the party of masses and this show of strength will definitely benefit them. Judiciary lost the show by setting up such a weak case against them even after being given due time and all sorts of support.. Things would be different if the decision would have been based on corruption or misuse of powers.. Behind the bullet proof glass, behind the veil. You will never be able to prevail. A careful but thorough review reveals that NS is the only person, who once has stood up for a cause, has brought about big changes. Whether it was bringing everyone together for the charter of democracy or playing an active role in restoration of judiciary. The important point here to note is that this time he is alone. Whether it was his carefully crafted timing in the past or he only picks fights he thinks he can win, remains to be seen and only time will tell if he is just frantically waving his hands before going down or actually has something up his sleeves. Speedy justice (a claim by PTI, which they haven't delivered yet). Hope all ends well for Pakistan. @AHAQ yes, he in pakistan, but no one else..
@Ayub Wow. So street crimes in Karachi have to be fixed by Nawaz too? Why you keep voting PPP and MQM and expect Nawaz to fix everything? It's shame that he lost whatever credibility had left ! NS, you gotta stop this victim card drama. Accept the fact that you were given a fair chance to prove your innocence and your family produced fake documents. Pakistan is not your family estate. Hopefully, next turn is for corrupt Zardari family to prove its innocence. We don't want to see this kinda "awami adalat" nonesense drama. The disqualification is real and for real reasons. There is no question about acceptance or dis-acceptance of disqualification by either Nawaz and those who follow him. Nawaz is in denial of the facts recently found by JIT and he is simply trying to fool people again. No logical and reasoned minded person will follow his denials. He needs to stop creating anti-law and lawless environment in people. @mrs.majid sheikh he done nothing special, this was his duty as PM and he done no favor to anyone, just done a good job as PM helping Karachi. Ex PM Nawaz Sharif should be in jail, he is openly calling for a mutiny and he is committing a treason. Nawaz Sharif thinks that he can start a revolution similar to what Tayyip Erdoğan had in in Turkey, this guy is gone too far and has to be stopped. The COAS has already affirmed that Pak Army is standing by law & constitution.The mobilization of innocent laymen by deposed PM is unlawful and his speeches are nothing but naked contempts of SC. The deposed PM will have to clarify his each statement in SC, once SC take up the contempt case. It's a matter of time. This corrupt person should be banned from having rallies and for having media coverage else we will have swat like situation all over again. All media who have given publicity to this anti-democratic insurrection should introspect how hey have been used by Nawaz Sharif for his perwsonal vendetta against the Constituion and Supreme Court. Didn't 5 people dismiss Gillani? And he was not even declared corrupt. I remember Nawaz chastising him that this was the verdict of the Supreme Court and he has to accept it. Now the shoe is on the other foot. I used to root for Nawaz, but no more. He is history, country needs to move forward, not backwards. 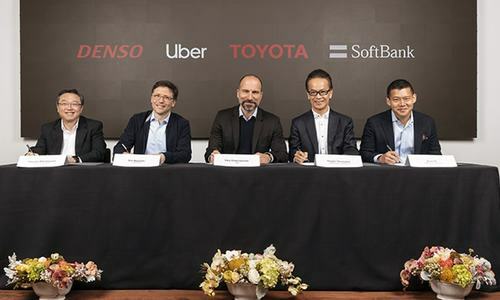 New leaders new ideas. Government is not a family business. Nawaz Shreeif, ex PM speeches are nothing but committing contempt of court. He has no respect of SC of Pakistan. Since he is thrown out of PM job due to his and his family's money laundering violations all of a sudden he forgot all manners and is against Pakistan judicial system. How a person of his mentality has been running as PM of Pakistan. He must be restrained for not to making inciting statements that can cause damage to public lives and property. Yet another Pakistani PM ousted. There has yet to be a single PM completing his/her term in Pakistan in the last 70 years. Ridiculous! @Sab se pehle pakistan Hahahah sub sey pehley democracy and thats what we saw. Nawaz is seeking help from other countries who are expert in bringing disturbance in the country. If you arrest whole leadership of PMLN, this story will end immediately and peace will return. Get rid off these corrupt politicians and bring technocrats under the supervision of Supreme Court and Army. What revolution...lol....he was the prime minister for the last 4 years! what did he achieve that was revolutionary? Paye and haleem? @Anti-Corruption_Pakistani His statements, such as: "Shouldn't there be a revolution?" he said. "Are you ready for a revolution?" he asked. are not only contempt of court but also seditious. He must be banned completely. For the last so many years we did not hear about a revolution, now all of a sudden what kind of a revolution is he talking about. His disqualification on a long standing corruption investigation is the actual revolution. Now he wants to revolve the time back to the days he got votes through his deceptive speeches. Wow such an incredulous and insane speeches by unpopular individual who have harmed nation.In the tech savvy world we are still being duped and misled by such politicians. Mian Nawaz Sharif is still prime minister of our hearts. PML N has developed into a madhouse; Nervous, guilty and dangerous. courrpt politician you are Mr. Nawaz, you always thinks for yourself and for the power / seat which you lost.. Thanks to our judges. @Amin saigol -Rest of the time NS will be in hearts only no more in Parliament.